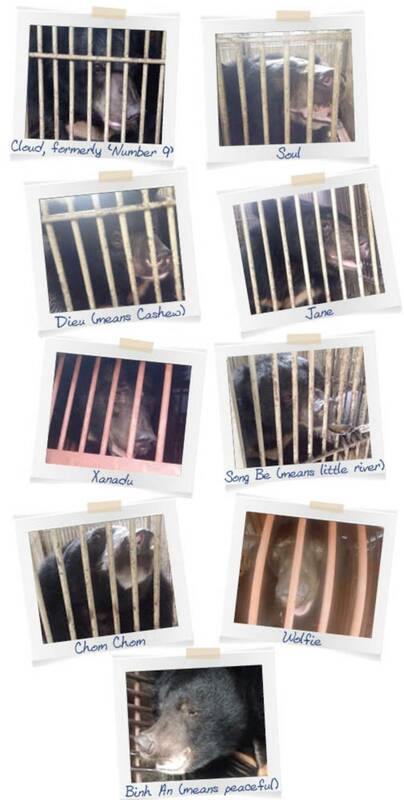 Mere days ago, these nine gentle moon bears were just numbers. Their value measured in the amount of bile their owner could harvest from their organs. But thanks to you, their lives are about to change beyond their wildest dreams. No more numbers, now they have their very own names. When our emergency rescue team reached them, we were stunned to find the state they were in. We’re especially worried about Soul. Her back legs appear to be deformed, and the dusty cobwebs at the top of her cage lead us to believe that she hasn’t stood up for many years. Binh An - His mouth is a mess. Teeth rotten. Part of his tongue is missing. Dieu - A massive deep scar all around her body from where she was trapped in the wild. Seems also to be causing mobility problems. When Dieu was sedated, she didn’t even flinch. She just stared into space, her spirit has been broken. Song Be - A tiny bear. Cracked paws. Cracked teeth. She is in a lot of pain. Jane - Terrible skin condition, virtually bald in places. Scars on her head from trying to erase herself from existence. Soul - Deformed back legs. Great concern that she is struggling to stand. Chom Chom - Has a "Joker" smile, his mouth torn at the sides caused by excessive bar biting. Wolfie - Skinny with wasted muscles. Suspected arthritis. But the most aware and active bear on the farm. We think he's going to be a very playful and cheeky bear. Xanadu - Multiple head wounds caused from obsessively rubbing against the cage bars. Very underweight. Damage to his tongue. Cloud - No tongue, likely bitten off or torn out. It would have healed without any pain relief. To eat the gift of honey we offered him, he had to take it in his mouth and throw his head back to swallow. So much pain for a little bear to go through. Wolfie is going to be a very cheeky bear, we can just tell! And Binh An is such a gentle boy, on the journey home he would take each morsel of food across to the other side of his transport cage to eat it nicely, then he’d return to his bowl to select the next delicious treat. The bears are in bad shape, and they will need extensive veterinary care in the coming weeks and months. We’re going to need your support more than ever. Now they’re waking up to their new lives, with new names, new sights and smells, and most importantly, they have a new and very special friend in you.